Artificial intelligence has the power to change our world, and it already is. 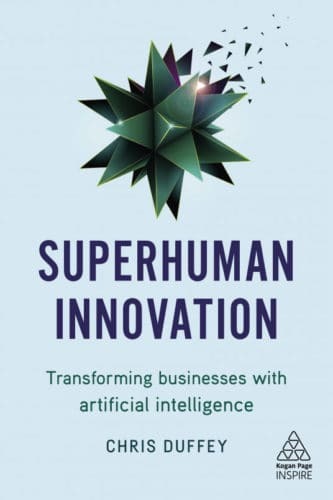 Learn how it will be applied and where it may take us, in Superhuman Innovation: Transforming Businesses With Artificial Intelligence by Chris Duffey. What do you do when you want to write a book about artificial intelligence but you’re a busy AI expert who happens to be Adobe’s Head of AI Innovation and Business Strategy? You create an AI to help you co-write the book and save you time. That’s exactly what Chris Duffey did with Superhuman Innovation. Aimé is an AI that co-authors Superhuman Innovation. It’s an interesting concept to have a conversational back and forth with an AI but though seems to slow the story at points. Still, bringing existing AI abilities together in order to write a book on the topic is a very cool concept and one unlikely to have been done before. Like most current books about artificial intelligence, this one looks at looks at how technology got to this point and opportunities for the future. While this one had its own interesting ideas about applications for the future, I’d love to find a book that looks at putting AI to use right now. The book is broken down into three sections; The AI Foundation, The AI Activation, The AI Future. They look at the history of AI and the abilities it offers, how it is currently being applied, and the ways it’s likely to change our work and lives in the future. It’s a good approach to understanding the progress, power, and promise of artificial intelligence. There is no denying that AI will transform more than we’re even beginning to imagine. With opportunities abound, one of the best ways we can invent amazing applications for AI is to understand how it works, how it’s being applied, and be inspired by some of the ways it may shape our future. Superhuman Innovation and the insight of Chris Duffey and his AI co-author Aimé help to do just that. Grab a copy of Superhuman Innovation: Transforming Businesses With Artificial Intelligence on Amazon now and prepare for a future where the combination of human and computer intelligence accelerates everything.